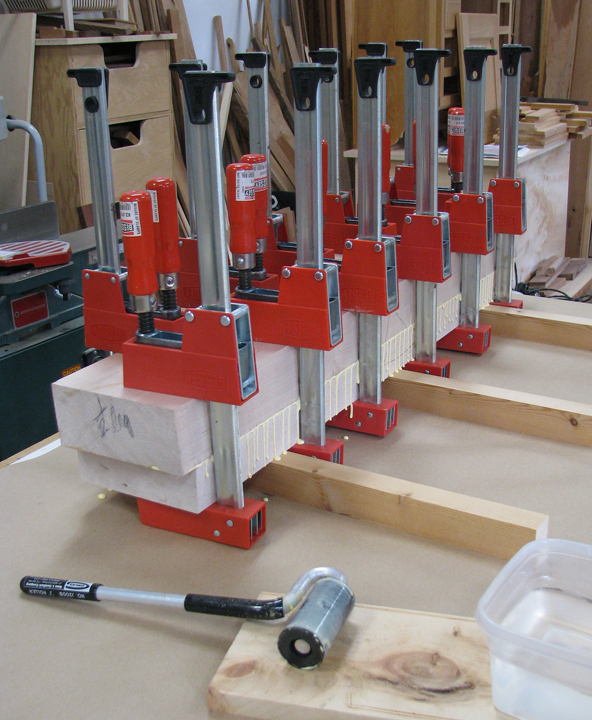 If you're building a Roubo (or any other substantially sized) workbench, before you start laminating boards to make the beefy legs, the first thing you need to do is buy stock in your favorite glue. 'Cause you're going to use a lot. 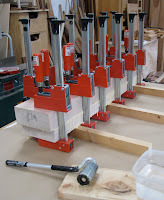 For covering large areas with glue, I use a J-roller from the big box store. It spreads the glue quickly and evenly. Just remember to rinse off the glue before it hardens. As the glued-up legs dried, I started working on the two 12/4 cherry boards that will form the benchtop. 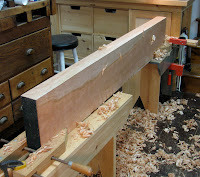 The boards were rough-cut, and I had already flattened and thicknessed both faces, so that meant truing one edge. I used the longest straight-edge I own and an engineer's square to check my progress as I handplaned the board. 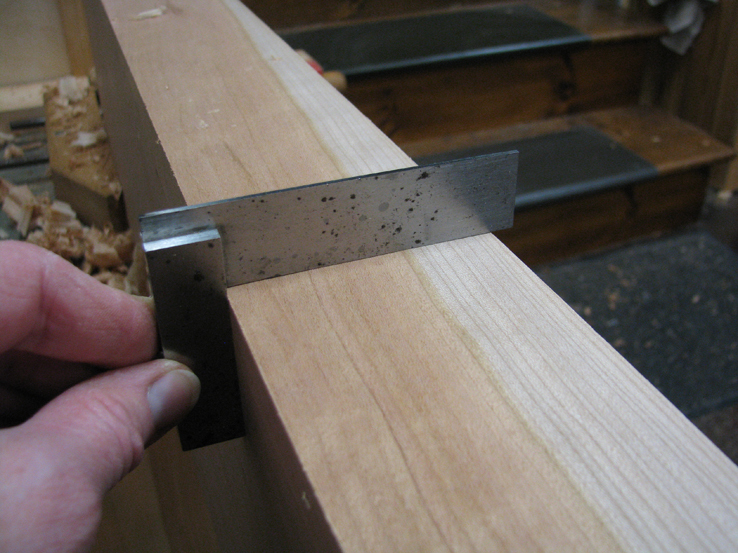 When one edge was as true as I could manage, I made a quickie marking gauge to mark the opposite edge for width. It's made from two scraps and joined at a 90º angle with screws. I drove a nail into the arm at the required distance, then filed the nail flat on the portion that faces the fence. 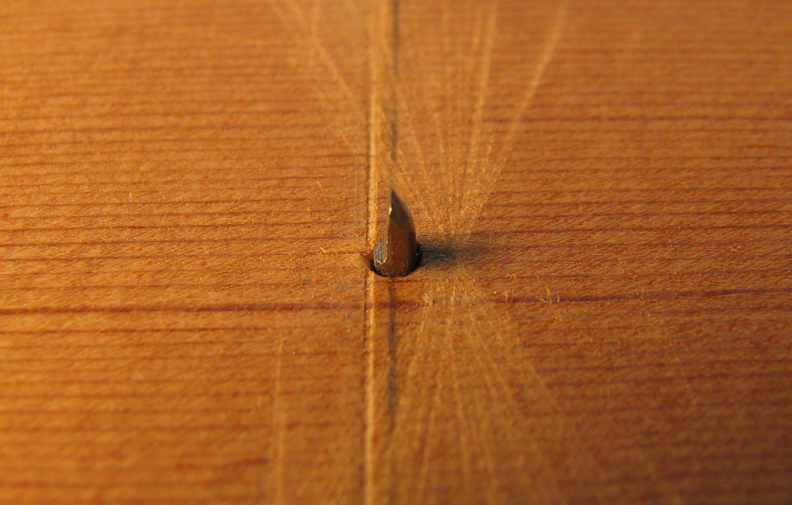 I rounded the opposing side of the nail to create a knife edge which produced a fine mark. I scribed both faces of the board and planed to the marks. 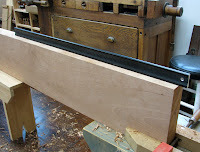 My sawbench and task bench are the same height, so they worked well together to support the boards as I planed the edges. However, after an hour, my back was killing me due to the low height of the surface I was planing. Curious, I measured the distance from floor to work surface. It was 28.5" and directly in line with the first knuckle on my little finger when I stood alongside the board. 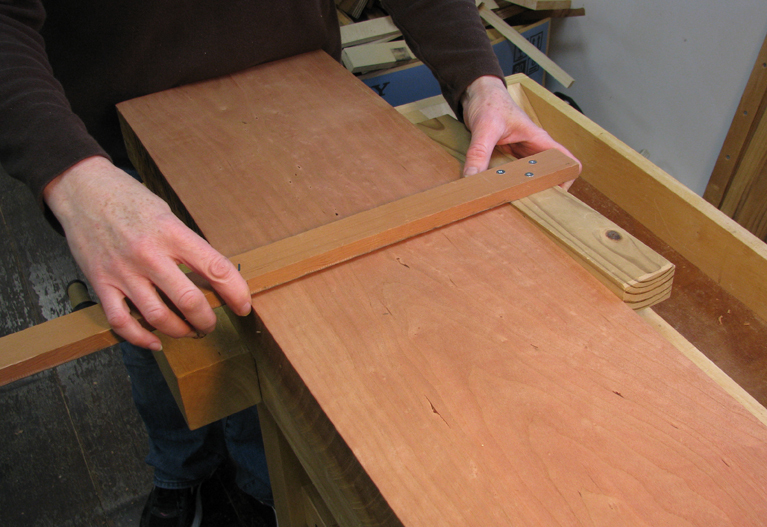 That's the distance that many books say is the ideal height for handplaning—in line with your pinkie. 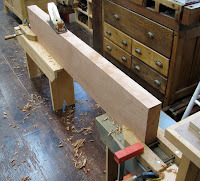 My workbench will be 33.875"—the same height as my existing bench, and a height that I find comfortable. If you're planning to build a workbench, this is a good way to determine the optimum height for you. 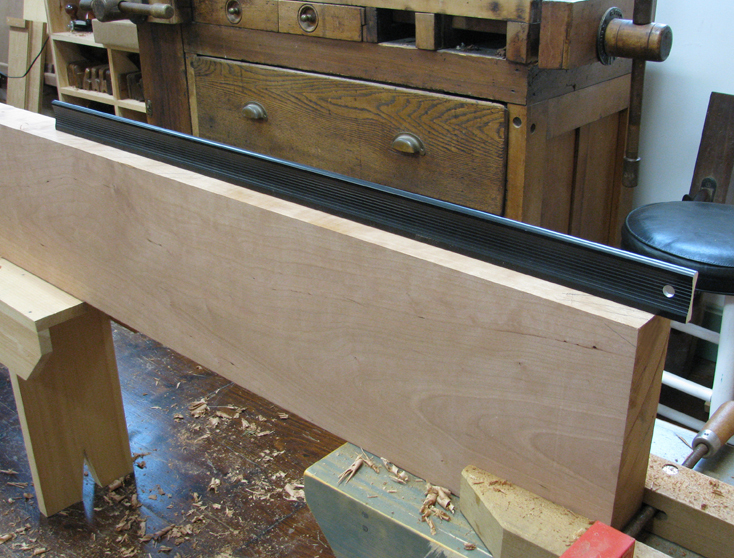 Lay a board across two benches and prop it up as necessary. Work at it awhile. Your back, legs, and arms will tell you if it's a good fit.